I was turned on to duck eggs a few years ago by, Mike, my roommate at the time. He’s a pretty well-known member of the Los Angeles food & beverage scene (if you ever need restaurant recommendations, check out his blog) and definitely helped me to take my cooking up a few notches. 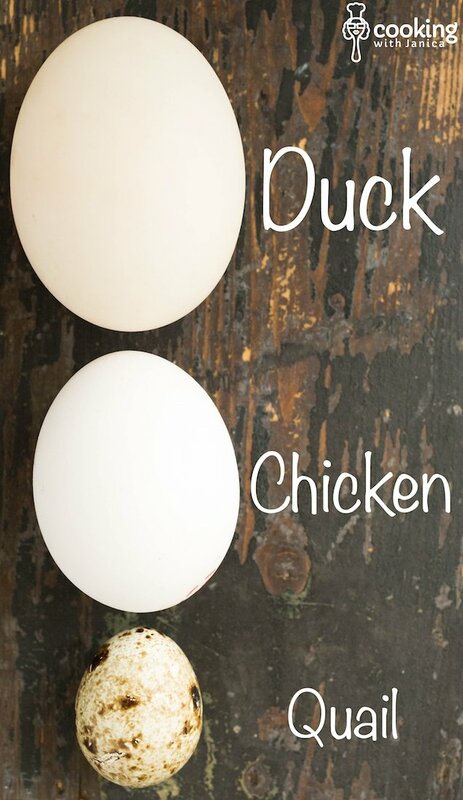 What’s so special about duck eggs? Not only are they a lot bigger than chicken eggs, but they are also much creamier, mostly due to the extra large yolk. I usually find them at the farmer’s market, but they are also occasionally available at Whole Foods and some Asian stores. I filled the bottom of the quiche with about double the amount of bacon as a “normal” person might. Adjust to your likening, but I say go balls to the wall with the bacon content. You only live once, it might as well be with pork clogged arteries. 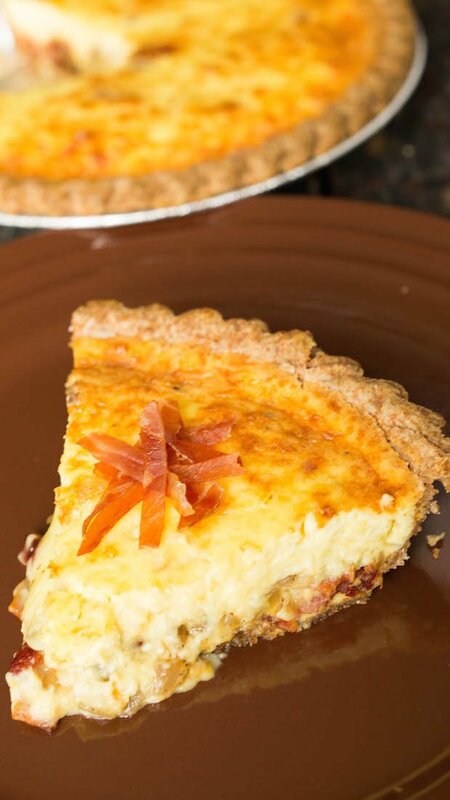 We topped the duck egg quiche with some fried prosciutto strips. Genius idea. Thanks, Janette! 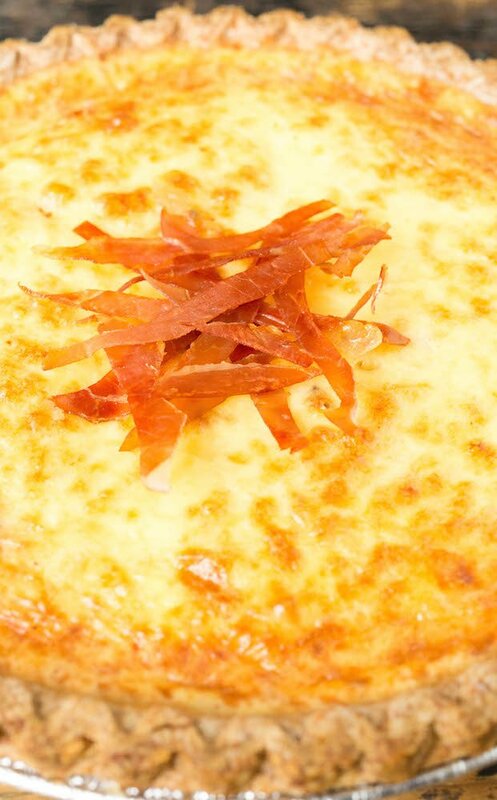 I make this duck egg quiche once per year, and it is one of my most looked-forward-to dishes. We also do another variation with prosciutto and sautéed peppers and onions. It is equally delicious. 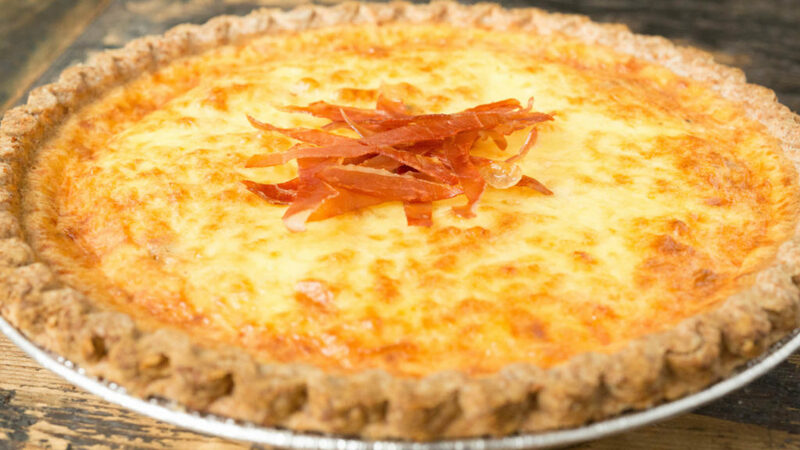 If you make any changes to the quiche, please let us know how it went in the comments. We love trying out new recipes! Cook the bacon until crisp. Leave the grease in the pan. Drain bacon on paper towels and chop when cool. Heat the grease up over medium heat. Add the diced shallot and cook for 2-5 minutes until translucent. 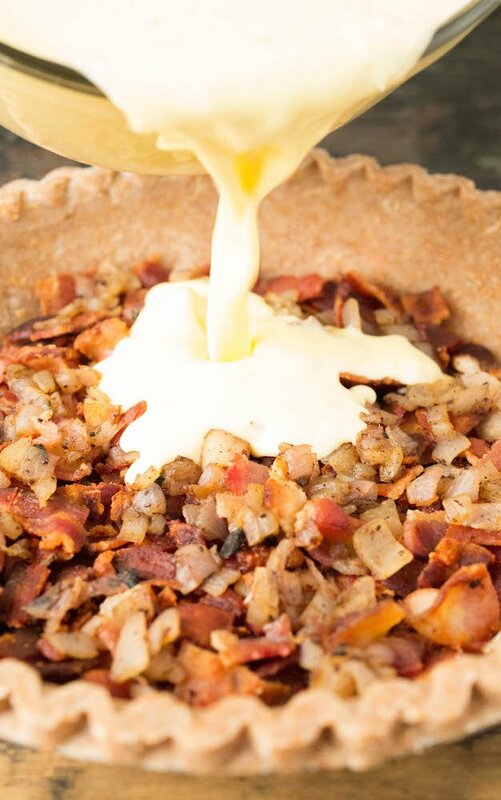 Mix the bacon and shallots together and evenly fill the bottom of the pie crust. In a large bowl, mix together the duck eggs, crème fraîche, whole milk, salt, and pepper. Once combined, mix in the shredded gruyere. Gently pour the mixture over the bacon and shallots. Spread evenly. Bake for 25-30 minutes, until a toothpick comes out clean when inserted and removed. Cut and serve immediately. To prepare the prosciutto, cut it into long, thin pieces. Heat up a pan over medium high heat. Place the prosciutto in the pan and cook for a few minutes, flipping occasionally. Remove and place on a paper towel until ready to top the quiche. Thanks. Great recipe and easily adaptable for other ingredients. I have small Indian Runner ducks so I use 5 smaller eggs instead of the 3. Just Excellent! I had some leftover home fries cooked in bacon fat that i put in the bottom of the crust. Then the bacon, then cheese, and the custard poured on top. Subbed half and half for the milk/creme tranche mixture. All ingredients at room temp. Took exactly 25 minutes. The prosciutto is a great addition. As we say in Maine, this recipe is a keep a. Thanks. So glad you enjoyed it, Mark! I recently got some duck eggs from a friend’s farm, and WOW were they custardy and delicious. This looks like a great way to use them! Yes, they are so creamy! I was surprised the first time I used them. Definitely, makes for a good quiche. We love duck eggs and found some at a local organic market. Can’t wait to use them for this quiche. I will try this thanks.